I came home from Southampton to find my mum had decorated our house early! 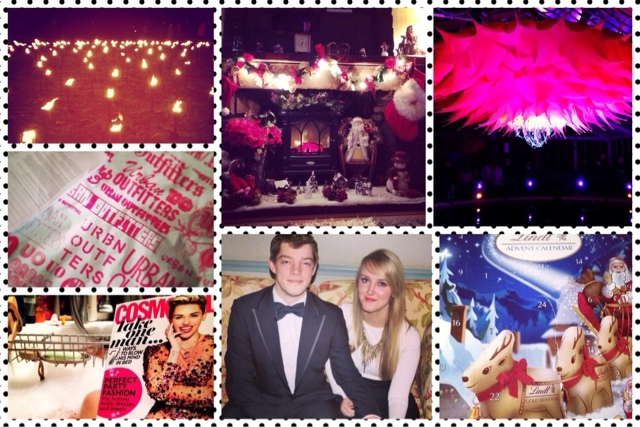 If you've read my Christmas tag post you will have seen the decorations already. I love our fireplace, every year we make it look like a mini winter wonderland and everyone who comes round seems to like it too! I used up the last of my Lush Christmas Penguin. It's so lovely and makes my skin feel so soft when I'm in the bath. I relaxed this week with Cosmo and Empire magazine - it's the perfect way to end a day spent at work. The last thing I bought myself in the run up to Christmas is an Urban Outfitters top, which I'll write about soon! I've decided to not spend any money on clothes or beauty products until after Christmas because I was definitely spending too much. I need to tighten my belt a lot! Sam's mum sent us photos from Thurlestone and there was a lovely one of Sam and I (bottom middle). I've printed it out and put it up on my wall. My dress is from Zara (I bought it when I was at Westfield a couple of weeks ago, and I still need to do a dress haul) and was only £29.99 - bargain! I hope you all have an advent calendar to open; my parents bought me a Lindt one and the chocolate is so big! awe i love your Christmas decorations! urban outfitters <3 one of my fave places haha!